Blackberry’s making some major changes this morning with the introduction of Blackberry 10. First things first though, RIM has declared that they shall no longer be “RIM” and henceforth will only be called “Blackberry.” More importantly is Blackberry announcing the availability of the Z10 on all four national carriers beginning in mid-March. 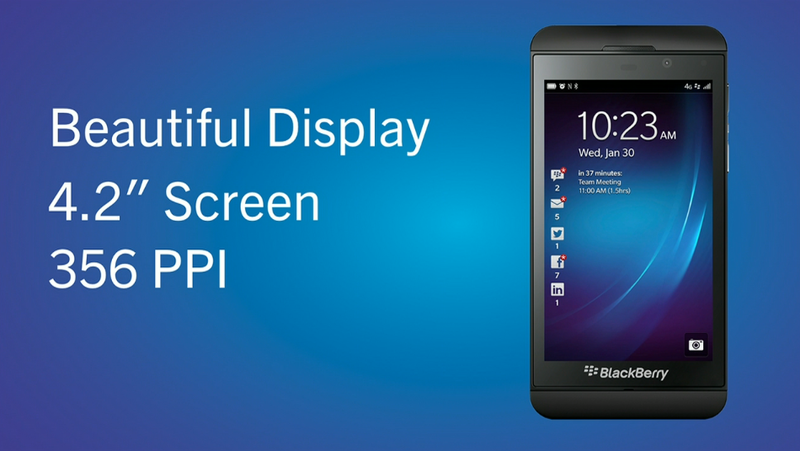 If you’ll recall, an early roadmap for T-Mobile indicated the Blackberry Z10 would launch on March 27th. Blackberry is touting the 4.2″ display with 356ppi, in both black and white models — however the white is a Verizon exclusive upon release. T-Mobile is expected to announce pricing and availability soon. I Was thinking the same thing, it is so stupid to do exclusivity and specially if you are basically starting business because RIM is almost dead. They should provide both color in every carrier so that the consumers motivate to watch them and consider to buy it. I was considering the white one, but no thanks now. I ‘ll just way until someone buy one and test it. David will be doing a review of this phone. I have already decided I am getting this one but am still interested in what he has to say about it. Thats good news, I saw a review in another page but they just gave more cons than pros. Honestly, they think that bb10 have no chance. I watch it and looks great, but the white one looks amazing. Its time to BB to do their thing, it just starting like iphone and android once did. We know for sure that windows phone is also here and let time pass by to see if it is the future. Could you please tell David to hurry up and get this review done? I’ve seen other reviews. But I’d like to see his review as well. Zacamandapio has asked that you please review this device STAT! We all know you have nothing better to do. That is the same thing a lot of people did when they changed from android to iphone…. It does look pretty sleek in black though. I am very interested in kicking the tires on this one. Exciting! I have to admit… BB10 is already looking better than WP8. I might actually get the Z10 when it’s released. I want it NOW!!!! Come on T-Mobile. The RIM IPhone. Honestly, they needed to do it just to thrive. Only problem I see is that Rim doesn’t have the funds to fend off apple like samsung does. This is a new OS and lots of patents they hold on their own. Lets see what happens. I will support RIM doing a good job if they can get manufactures on board. I don’t care to see RIM nibble at the market. Sell your OS to Manufactures and drop it likes its HOT! What does this BB10 has that already being used and loved mobile phones dont have?? Anyone knows…please share. How can I think of getting BB10 ?when I am using G Note II alongwith iphone 4s as a back up phone, need some reason to go jump and get a BB10. it doesn’t have anything new. it’s just a “new thing” that’s all. people get excited over new tech releases no matter if they’re actually new or not. this device won’t do anything the Note can’t already do and any other phone out today. it’s personal choice i suppose. if you want some Enterprise type goodies sure i guess but for normal people .. if you have a Galaxy S3, Note 2 etc .. there’s hardly any reason to drop those for this device unless you’re a BlackBerry fanboy much in the vain of iPhone fanboys etc. But there is people who actually dont want to spend in an iphone, and others dont like android OS, so they stick with their BB. Now they have the opportunity to live it just like android fans and iphone fans enjoy it. For you is nothing new, but for BB users that still own their BB phones or those who are tired of android and iphone want something different to have, then they have it. I love android, and I prefer it over iOS, but sometimes I want to use something different like and iphone or a windows phone. And BB deserves an opportunity because they atract a lot of people and I know a lot of them that change to iphone but they still prefer the BB ecosystem. True, but I don’t think that this new Blackerry & OS is necessarily supposed to be new, I think they’re trying to win their Blackberry customers back, because most at this point have switched to an Android or an iPhone. A lot of those consumers didn’t necessarily want to switch, they just got tired of Blackberry lagging behind, like with their apps, web browsing, & the sluggishness. It’s one of those cases where it’s like “you can’t please everybody”, “some like it, some don’t.” Kinda like your Blackberry fanboy comment. As a former Android, Meego, iOS, Maemo, Symbian, WM6.5, WP 7.5, and all in between I can tell you that I’m happy that BB is releasing a new OS for their phone line. Besides the worst that could happen is dropping it and go back to any other OS (and probably come back to a BlackBerry like I always do). Screen sharing, time shift camera, true and realtime multitasking with an innovative UI / application flow, integrated inboxes. To name a few. if i am not wrong these arent new features……just different names of the features already being offered. I totally agree with Deacon comment above. But i am still curious about this device since there are so much talks about it. I’m confused. If you’re looking for a reason to get another device does this mean you’re not happy with your current devices?? And if you just want another phone then why don’t you take it upon yourself to do a search and read about it yourself instead of asking complete strangers on a blog. Oh Drew, sorry to get on your nerves :) it is just a discussion about a phone and dont get so uptight about it. I did do search ….dont you know what brought me here on tmoNews? i was searching for what people think about this BB10 and if i like i might get myself one. thats all . I hate the fact that you said nothing about the device, at least you could have share your thoughts about the device. i like my current device but not so much in love with them ….since you asked. You don’t have to. The Galaxy Note II is a beast. It’s BlackBerry, not Blackberry. Idiot. Sorry, I’m SUCH an idiot! When are you going to post a review? Wow, thanks for the clarification. With that lowercase b I thought we were discussing a different company altogether. WHEW! Does anyone know if it’ll have UMA? I haven’t heard anything about it and it’s my favorite feature specially for travelling. Any word if it’ll have UMA?